Gulf Front, Seabluff Condo #6 NEWLY RENOVATED !!! Gulf-Front condominium located along the beautiful 'Emerald Coast', in the Blue Mountain Beach area. Blue Mountain is quiet and family friendly. Enjoy breathtaking views of the Gulf of Mexico from the living room and master bedroom. There is a patio area for lounging and an outdoor shower to splash off with after a hard day at the beach. For those families with 'little ones', there is a grassy area for play directly off the patio. If the waves aren't for you there is a community pool available on the property too. Both bedrooms are located on the upper level of this condo. The master bedroom is very spacious and has a King bed as well as a twin futon. The second bedroom has 2 double beds for extra sleeping room and a private bath. Unit has hardwood floors on the lower level, mirrored wall for the extra reflection of the Gulf and decorated in muted yellow and wood tones. New furniture throughout added in January 2009. Queen size murphy bed in the living area for extra sleeping accommodations. This bed is set into a custom made cabinet which holds the TV and has extra shelving. Unit is 1580 square feet. We love staying here, everything was perfect. Can’t wait to go back! So happy you had a great vacation! Looking forward to your next visit. Thank you for staying with us! Nice and comfortable. Wonderful view of the ocean. The key to the House was not left in the lockbox and we were given the wrong code to the beach, but Mary brought us a key we found out the code easily. The previous weeks garbage was not picked up and neither was ours for the week so it was overflowing. Otherwise we enjoyed our week in #6. It was clean and equipped with everything we needed, beautifully decorated and a great view of the ocean from our deck. Maybe we can go again next year. We have stayed at this condo several times and love the location and the decor. The only issue we had was the large number of palmetto bugs that were present and although I know this is something that you will encounter a lot of outside there seemed to be an abundance inside the condo as well. Also some new bedding might help as some of the blankets were quite stained. Great condo with exceptional location in Blue Mountain on 30-A. SeaBluffs #6 was an ideal spot for our family vacation this year. It is literally right on the ocean and there is nothing between you and the ocean when looking out the backside of the unit. The location is almost across the street from Sally’s, which has you covered for the small things you may need from breakfast sandwiches and soft drinks to beer and ice. And there is a Publix a couple of miles away for the big items. The unit itself is comfortable and clean with most anything you might need at the ready. We truly enjoyed the proximity to the beach as we didn’t have to worry about loading up a day’s worth of items and carry them down to the beach each morning. We could easily come back up and grab what we needed when needed. The ONLY thing to point out to any families with members who may struggle with stairs is that there is a mighty run of stairs that is your only beach access. 71 stairs to be exact. We enjoyed the exercise to be honest but if you have anyone that is elderly and limited or might be recovering from an injury, I think it’s only fair to let you know. We are big fans of SeaBluffs #6 and highly suggest it to anyone looking for an oceanfront view with great access to all the fun in Blue Mountain and on 30-A. We will look forward to returning next year! Spacious condo with gorgeous views! This condo sits at one of the highest points on the Gulf of Mexico -- and the views from both levels are amazing. We found it extremely comfortable, with a strip of grass between the ground-floor deck and the gentle bluff beyond -- perfect for our kids to play, and very safe. We had visitors during the week, who slept on the Murphy bed in the living room (which, when up, is tucked into a beautiful entertainment unit!). Internet access was consistently OK. The pool is nice, and the complex is quiet and friendly. There are shops, kayak/bike rental places, a bakery and a health food store within walking distance. We brought kayaks and used them in the bayous, dune lakes and bay, all within a short drive. The only possible drawback is the walk up to the unit from the beach (many stairs on the beach access). It didn't bother us at all, but this would be unsuitable for someone who has difficulty with stairs. 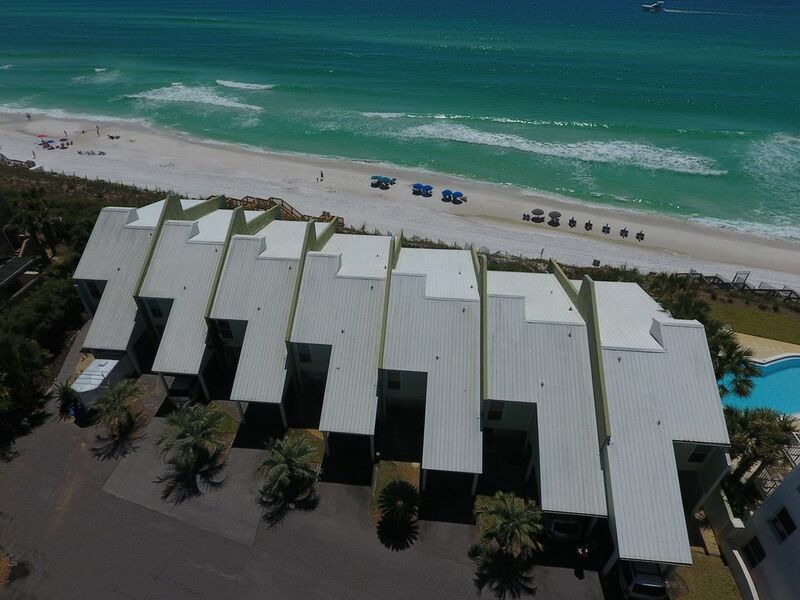 The folks at South Walton Realty were very nice, and we'll definitely book this unit through them again next year. All in all, Seabluff #6 was perfect for our family. Vanessa - thanks for the great write up on our Seabluff 6 unit. We are so glad you enjoyed it and all our beautiful area has to offer! With the recent remodeling done in the unit, it's nice to know that it's appreciated. Thanks again and we are looking forward to seeing you and your family again soon. *Total does not include: mandatory cleaning fee, laundry fee, travel insurance, and taxes.